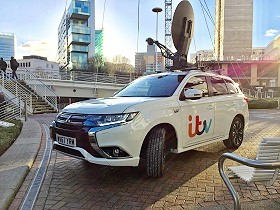 ITV Studios deploys OB car with KA-sat and LiveU solutions. Hackensack, NJ, March 2018: ITV Studios’ Daytime team – with programmes such as Good Morning Britain and This Morning – decided in 2017 that they wanted to reduce their environmental impact and after much research, opted to deploy a combination of hybrid fuel vehicles and LiveU technology to achieve their aim. LiveU UK partner Garland Partners worked closely with systems integrator Broadcast Wireless Systems to allow ITV Studios to achieve this.